In the past, communication aid users often had limited choices when it came to the pictures and symbols used for their vocabulary needs. Many kids with challenges such as Autism could sometimes have difficulty interpreting generic symbols that weren’t personal enough to seem related to their daily lives. And many adults felt that simple pictograms were not appropriate to their level of maturity. That’s why, when we designed MyVoice, we built in great features that let users add personalized, real-world pictures to their vocabulary. With MyVoice, vocabulary and the images associated with them can be as personal or unique as you wish. For many of our users, it’s so important that the images be of actual things in their lives such as their bed, clothes, or familiar settings. 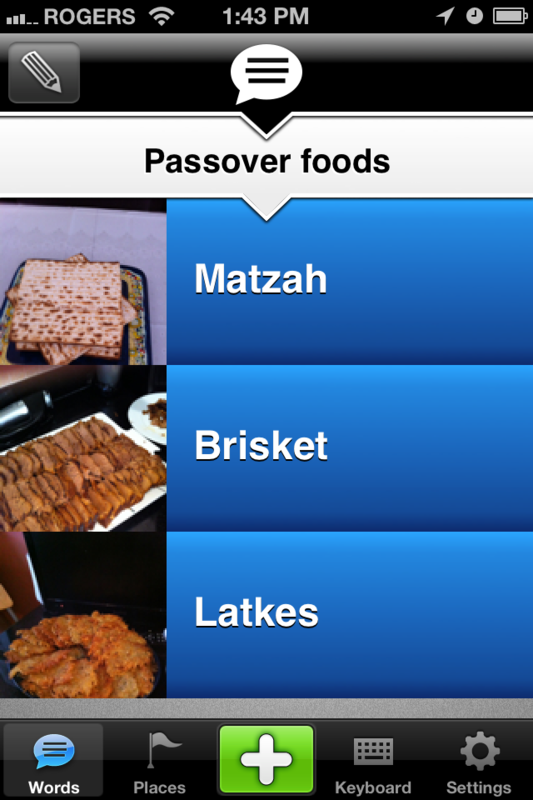 MyVoice still lets you import any “traditional” symbols systems such as “PECS” if appropriate, but you can also choose photos from your own files and take pictures through your mobile device if it has a built-in camera. 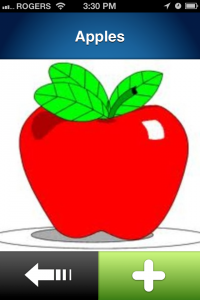 So, for example, if a user is comfortable with a graphic representation of an apple, it can be used. 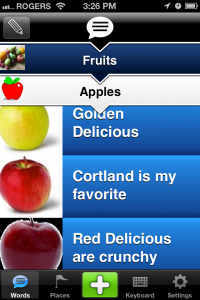 But with MyVoice, you can also have every variety of apple in existence with a real photo and custom phrasing. Recently, at a family dinner celebrating the Jewish holiday of Passover, I was with my adult cousin with Autism. 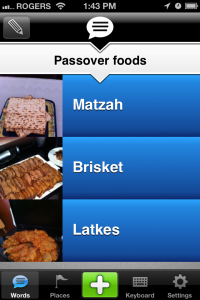 In less than two minutes on my iPhone, I created a list of Passover foods on the buffet and added actual pictures of the items. My cousin who loves food and has never used a touch device before instantly grasped the taps and swipes of the device and was gleefully choosing from the list of foods familiar to him but not normally found in traditional AAC aids and apps. If you’d like some personal help trying these features out, please send me a message anytime at support@myvoiceaac.com. After a wonderful week of people sharing their autism stories to help raise awareness, we’re delighted to announce our four prize winners. The winners were selected by random draw. And thank goodness, because every single one of the dozens of stories we received was deeply moving, important, and inspiring. 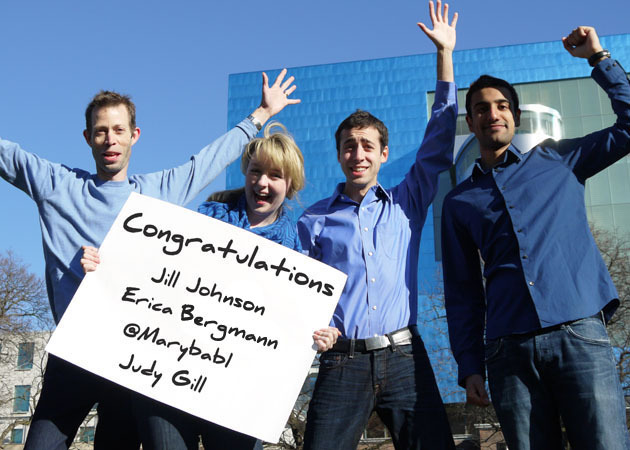 Tony, Andi, Alex, and Aakash of MyVoice in blue for Autism Awareness Day. Share your autism story and you could win a new iPad with MyVoice or one of three copies of the MyVoice app. The MyVoice Communication Aid app was built from the ground up to be a great tool for kids and adults with autism. Right now, it’s helping thousands of people on the spectrum communicate and live life to the fullest. Long story short: autism is really important to us. So on April 2nd, we’re joining communities around the globe to celebrate World Autism Awareness Day. And we want you to celebrate with us. That’s why we’re launching the MyVoice Autism Awareness Contest. This contest has now closed. Thank you for your participation. 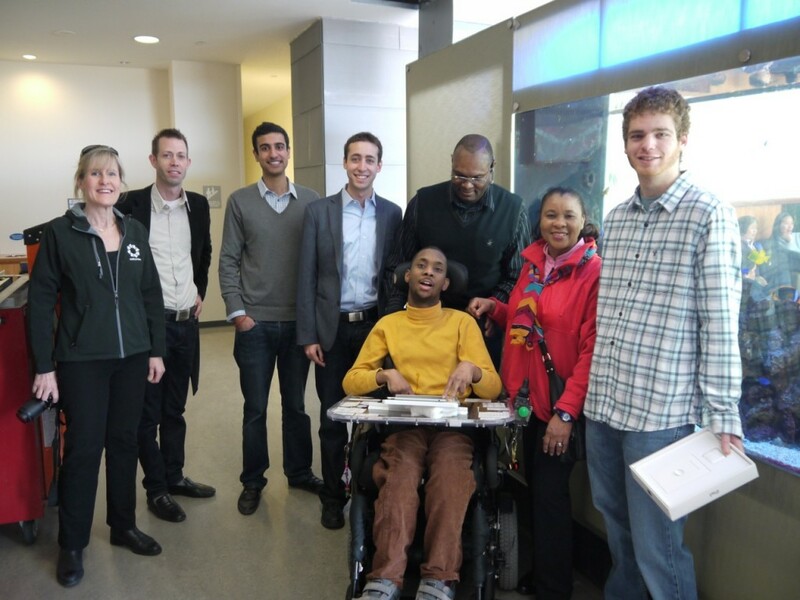 In October 2011, the MyVoice team met a young man with Cerebral Palsy named Tyler Austin. 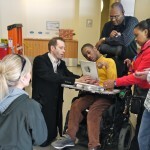 Having tried many different communication aids unsuccessfully, Tyler and his parents Pam and Eric were searching for an AAC solution right for him. Using finger spelling on letters and short words on his wheelchair tray was simply not good enough. 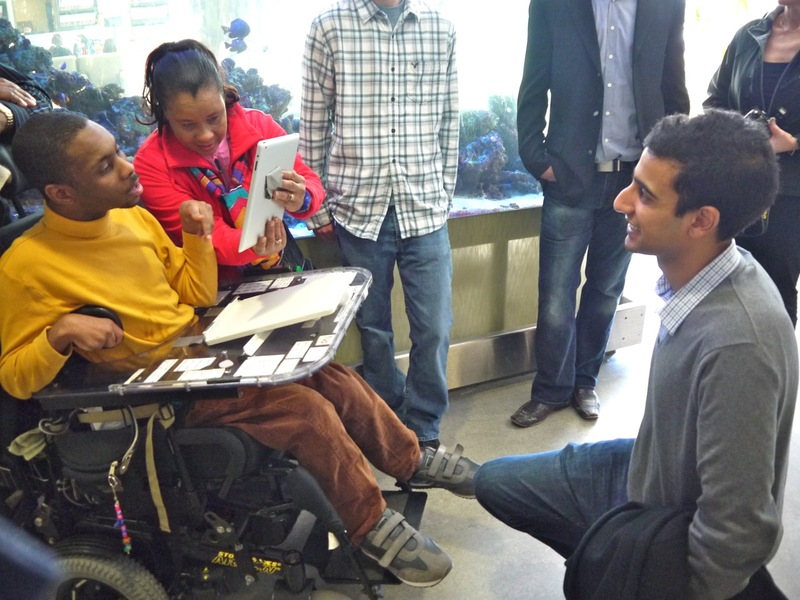 After 20 minutes with an iPad and MyVoice, Tyler had mastered both the tablet and the MyVoice app. In minutes, he wheeled over to the hospital coffee shop and ordered his mom a coffee, greeting the staff person by name- “Hi Bev, may I have a medium french vanilla coffee”. Everyone was floored. Having found a suitable communication system, the problem now was how to put it in Tyler’s hands. 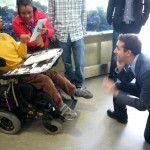 Five months later, June Chiu of the Holland Bloorview resource centre matched Tyler with Ability Online’s new funding program, Ability Gives. 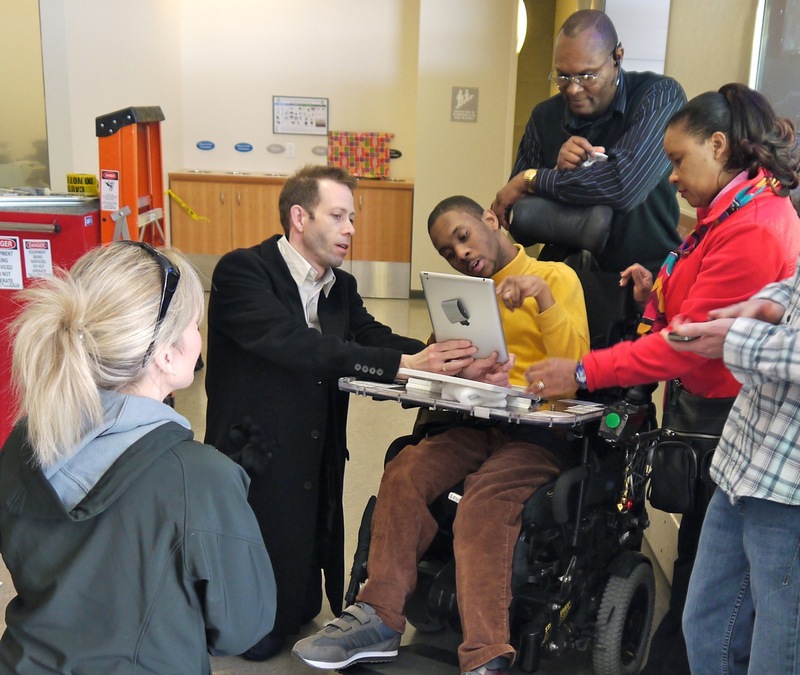 Together, Ability Gives provided Tyler with a new iPad and MyVoice provided the communication software. 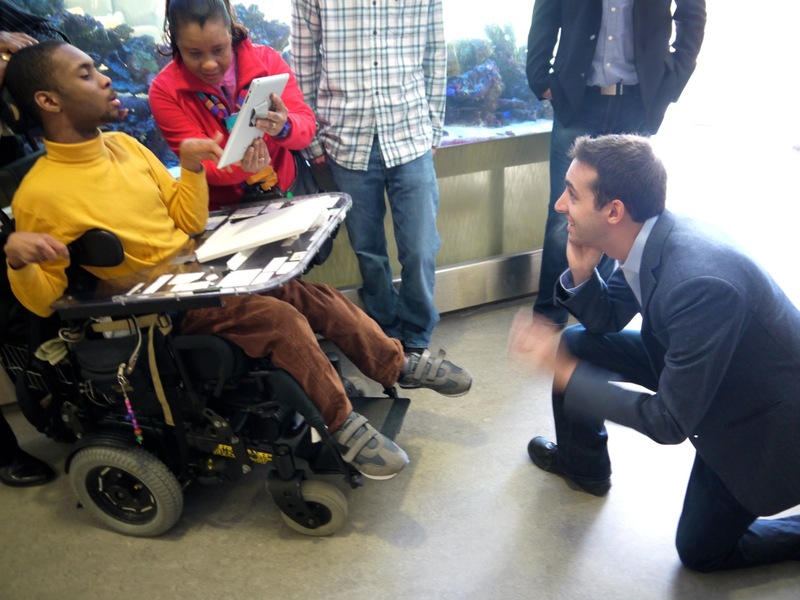 A few days ago, we were delighted to join Michelle, Corey, and Adam of AbilityGives at Holland Bloorview Kids Rehab to present Tyler and his family with their new iPad running MyVoice. It’s exhilarating to know that as a young person transitioning to more independent and adult living, Tyler is now equipped with tools for communication and learning suited to his capabilities. See the full story at Abillity Online. Thanks to all the amazing people that made this great donation possible! From the very beginning, we have strived to make the world’s easiest to use communication aid. Our goal is for users to be able to download MyVoice and take advantage of its features right away, no courses or manuals required. So at our latest conference we took a big step in that direction with our 60 Second Guide to MyVoice. On just one side, of one sheet of paper, is enough information to have you using MyVoice like a pro. In just a minute you can learn the ins and outs of the app, how to take advantage of our innovative features, and you’ll be experiencing AAC like never before. Visit the link below, and soon you’ll be an expert on using MyVoice – the smart, yet simple communication aid.